This is a fun activity to do at home, with or without your children. The last time I did potato prints I was at primary school. I cut into the potato using a blunt kitchen knife and used thick poster paint to make patterns on paper. However having a go again with them I found that you can get a really great effect. Cut your potato in half cross wise. This is the best way to do it as it is easier to handle that way. Obviously the size of the potato will determine the size of the print. You can also use other vegetables of course. A carrot works well, but obviously it will be quite a lot smaller than a potato. You can print with the potato as it is, or you can now cut a pattern into it. You can also shape the outside edge of the potato. 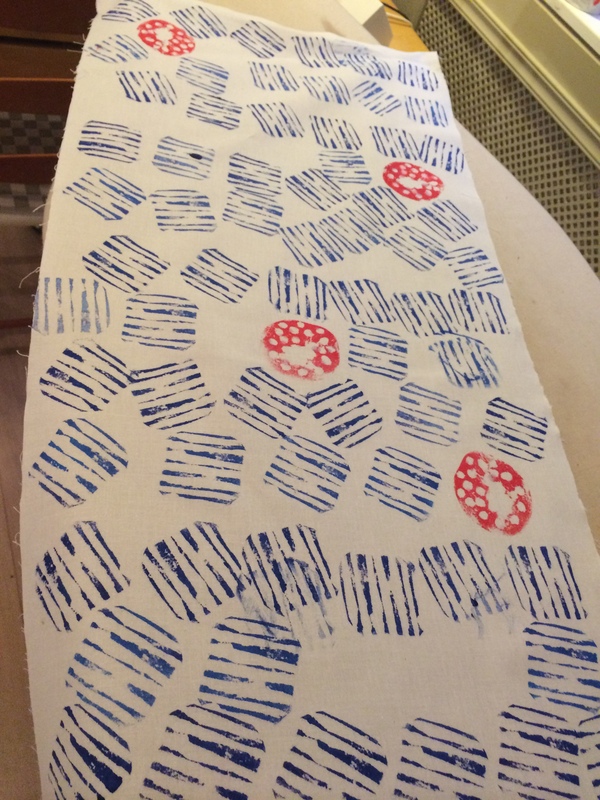 My blue one is “squared off”, or you could cut a zig zag or other pattern into the skin. I used a lino cutting tool to do the cutting, but you could use a small sharp knife, a corer, or small cookie cutters to get a specific shape like a star or a heart. Have a look to see what kind of implements you have in your kitchen or tool shed. Potatoes are cheap so you can probably experiment a bit with the look that you like. You can test the design on paper first. Use one or more colours of washable textile ink. The best way to apply it is to use a roller, although this is quite wasteful as the ink absorbs into the sponge. Alternatively you can paint it on with a paint brush. If you use the primary school method (dipping the potato into a puddle of paint) you will find it quite blotchy and uneven. You can print on most white cottons, or lighter coloured fabrics if you prefer. I used a firm off-white cotton. For my design I used navy ink on the stripe pattern, and then mixed a little turquoise in to continue with the pattern. For the spotted look I used red and orange. My pattern is quite uneven but you could do a very regular pattern too. Sometimes you might drop your potato or get an uneven print. In my view this doesn’t matter. It would be quite possible to print a couple of meters of fabric to make a garment. I love this! It looks like a fun project that gives great results. Perfect for a cold weekend…hum, you just gave me the inspiration I need! I think even I could try this without botching things up too much! Nice idea. Love your print! You inspired me to get some Lino carving tools, and while I was in the art supply shop I got some easycarve as well. I am always worried the potato is not going to last for the whole fabric length. But yours looks great, so maybe I ought to give it a try. WHAT! AMAZING. My brain is going full force. I think we are copying this idea today.